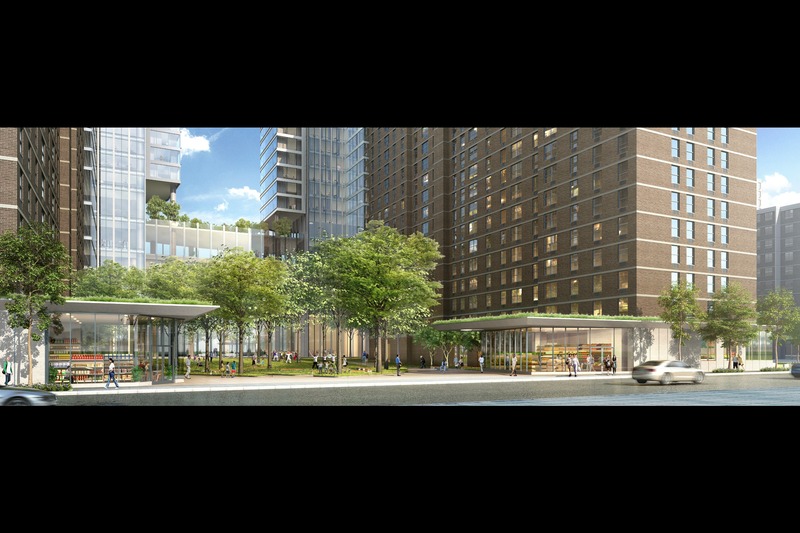 A rendering shows the landscaped courtyard planned for the development at 260 South St.
LOWER EAST SIDE — Developers revealed plans to build a pair of towers surpassing 60 stories between the waterfront and an affordable housing complex on Cherry Street — a development residents say will harm their quality of life by blocking views while further congesting the neighborhood. The proposed development from Two Bridges Associates — a joint venture between L+M Development Partners and the CIM Group — would consist of a 69- and a 62-story tower on a shared base at 260 South St.
At a Thursday presentation held for the tenants of the neighboring Lands End II complex, residents revolted when the developer outlined the specifics of the plan, which would bring an estimated 1,350 new apartments to the neighborhood within the next five years. White, 73, said that she cherishes the view she has enjoyed from her 23rd floor apartment at 265 Cherry St. since 1979 and is angry at the thought of losing it. “It’s like, 'Boom,' you hit me in the chest,” White told DNAinfo New York after the meeting. “I’m a senior citizen and that view is very important to me. The proposed development is one of four massive projects slated for the waterfront area. An 80-story luxury tower from the Extell Development Corporation is already underway at 252 South St. JDS Development plans to erect a 77-story development nearby at 247 Cherry St., and the Starrett Corporation is planning a project at 271-283 South St. 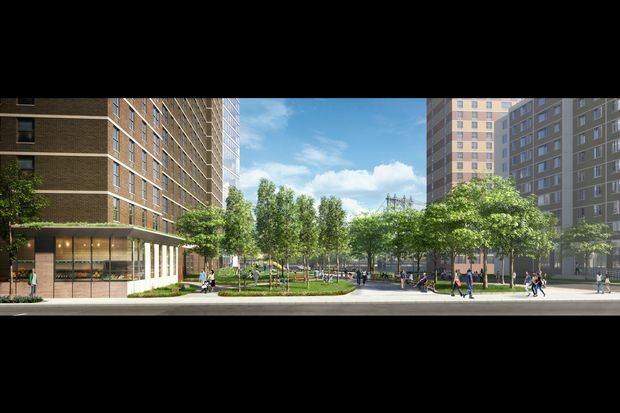 The 260 South St. project would consist of the two towers on a shared base at the address, which currently holds a parking lot for the residents of Lands End II at 265 and 275 Cherry Sts. The tallest tower would rise to 798 feet, while its shorter counterpart would cap off at 728 feet. Of the towers’ estimated 1,350 apartments, 25 percent — or as many as 338 — would be permanently below market-rate, the developer said. The project comes with a handful of amenities, including a landscaped courtyard that would hold a garden and new seating areas for seniors, as well as play areas for kids. The parcel would also include new retail space — likely a supermarket or pharmacy, the developer said — that would replace the community room currently used by Lands End II residents. A new community room would be built across the courtyard on South Street with residents’ input. Regarding the courtyard, reps for the developer said they were committed to beautification efforts for current residents, in part out of a recognition that the proposed development will be a burden to many. “We really want to focus on improving quality of life,” said Katherine Kelman of L+M, noting the scope of the courtyard would not be possible without the accompanying residential project. But incensed residents said the courtyard and retail space were not enough to make up for blotting out the views from their windows. Residents also expressed concern over the increased number of residents the new development would pack into the area, which has already been targeted for a handful of skyscrapers. “Not only are we talking about the building, we’re talking about people on top of people,” noted White. Another neighbor questioned how the area’s limited transportation options would accommodate the waterfront’s swelling numbers. The developer said it would evaluate the impact of the project on infrastructure and the environment, along with other similarly sized projects slated for the immediate area, as part of a city-mandated review process. The Department of City Planning has kicked off a collective vetting process for the cluster of towers: the 260 South St. towers, the 77-story tower residence from JDS Development and the Starrett Corporation's project. Extell's tower will not be included in the review process. The process will be directly informed by a community “task force” made up of tenant representatives, neighborhood groups and local business owners. Locals will get a chance to weigh in at a handful of upcoming meetings, the first of which will be held on Dec. 15 at 6:30 p.m. at 227 Madison St. Three more will follow in January, February and March. The developers will also host two open space workshops, in January and February, that will allow community members to offer feedback on plans for the courtyard area.